This attractive watch is perfect for the active woman, especially the one who enjoys being in the water. I say “especially the one who enjoys being in the water” because this watch is unbelievably water-resistant. This Aquaracer can stand up to 984 feet of water!! While this particular timepiece is a bit large for most women’s watch sizes, its durability and versatility make up for it. The dial is made of scratch-resistant sapphire, and the fold-over clasp has a double-push button for extra lock security, which is really nice. With that safe feeling that your watch will stay attached to you, along with the waterproof feature, you can take this watch with you on most any swimming adventure. With a black colored dial, this watch really stands out because of all the stainless steel surrounding the case. My favorite part about this watch (besides the water-resistant feature) is that is has a calendar date function. Too often am I forgetting what the date is, and I can’t find my phone right away. I’m sure that anyone would find this feature to be of great convenience to have right at their wrist. This watch weighs a mere 10.4 ounces and has Swiss-quartz movement. The bezel function is unidirectional. I really like that there are regular numbers on the clock which allows for quick and easy time readability. In addition, there are also minute times around the bezel (10 minutes, 20 minutes, etc.). This watch is listed at $1,700. Although this watch is quite expensive, the water-resistant function and other features are worth it, in my opinion. You really do get what you pay for when you purchase this watch. 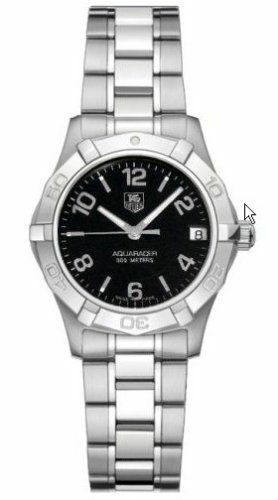 Tag Heuer is a name you can trust.